Posted on January 25, 2019 by Mia T.
The Penderwicks series by Jeanne Birdsall is one I have been reading for years and have yet to tire of. The series is about four sisters named Rosalind, Skye, Jane, and Batty. Shortly after Batty, the youngest, was born, their mother passed away, leaving their father to care for them. Mr. Penderwick is a botanist who throws out Latin phrases along with advice to his daughters. He can be quite lenient and unsure of his judgement, but he has his daughters’ respect and love. I love how each of the sisters is so unique and wonderful in their own way, and how Jeanne Birdsall writes from their perspectives is amazing. The sisters have such contrasting qualities, but these qualities compliment each other. Their father raises them with solid values, and though they make some mistakes, they are incredibly down-to-earth characters who find ways to solve any issues they have. One aspect I find entertaining about their relationships with each other is the meetings they have, which are called “MOPS”, or Meeting of Penderwick Sisters. The sisters discuss problems they’ve noticed with their family or friends, and how they may be able to solve them. Despite their separate personalities and occasional arguments, the sisters are still so close and supportive of each other. Rosalind is kind and compassionate, and is a wonderful older sister for her siblings. She is especially fond of her sister Batty, who is very attached to her. Her maturity and leadership results in her sisters looking up to her, even when she questions her own abilities. Skye is adventurous and impatient with frivolity. Her relationship with Batty is entertaining to read about; Skye is uncertain with how to act with her younger sister while maintaining a tough exterior. Jane is a writer, with her mind constantly wandering, even during conversations (which tends to irritate Skye). On the Penderwicks’ trips throughout the series, Jane consistently manages to haul a stack of books with her. Batty is curious and shy, and she loves animals. Her sisters are protective of her, even if some of them pretend they aren’t. As the series progresses, the sisters grow older, and their changes in character are interesting to see. Though the plots of these books don’t revolve around a real villain or conflict, the stories are still so exciting, engaging, funny, and heartwarming. This really is a wonderful series, and the audiobooks read by Susan Denaker are amazing as well! 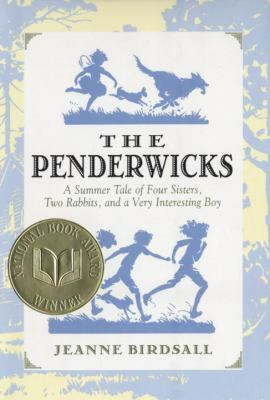 The Penderwicks series by Jeanne Birdsall is available for checkout from the Mission Viejo Library.